Expectant model Doutzen Kroes wed and her boyfriend, producer/DJ Sunnery James yesterday in a small, private ceremony in her Dutch hometown of Eastermar. According to Page Six, the wedding took place in front of the model’s 30 closest friends and family members. The bride wore a dress by Spanish designer Pronovias, and the happy couple will be honeymooning on an island just north of Madagascar. In lieu of gifts, the pair are asking for donations to be made to dance4life, a Dutch charity for which Kroes is an ambassador, or to the World Wildlife Fund. The couple, who were engaged in January, announced in July they were expecting. The baby boy is due to arrive January! 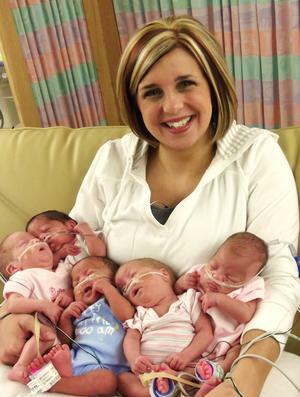 Ohio Quintuplets Born in August Making Good Progress!